I didn’t go anywhere for spring break. I’m home to clean, relax, and read. Yesterday I got most of my business done: phone calls, appointments for home maintenance, declutter tasks. Today was my day to relax. What did I do? Well, it’s Tuesday. That means BOOK BIRTHDAYS! I drove to the local bookstore to shop. I’ve been waiting for Booked by Kwame Alexander since last November. 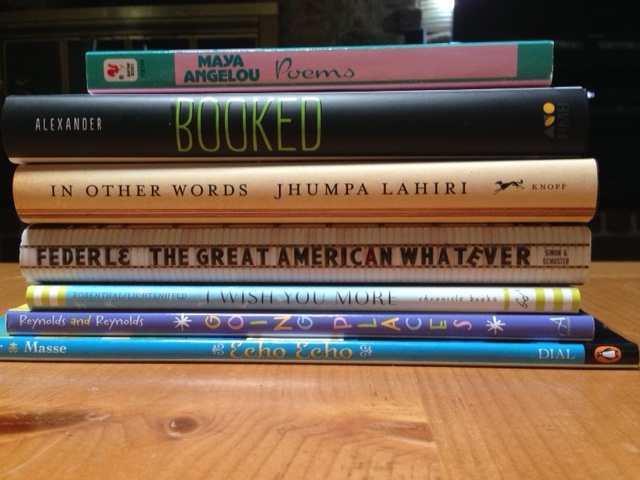 I gathered The Great American Whatever by Tim Federle, I Wish You More by Amy Krouse Rosenthal and Tom Lichtenheld, and In Other Words by Jhumpa Lahiri (Winner of the Pulitzer Prize and my adult title of the day). One of the clerks asked me if I needed a shopping bag. I replied, “No, thank you. If I have a shopping bag, I’ll go over budget. Carrying these keeps me safe.” She giggled at my logic. I giggled, too, but it was true. 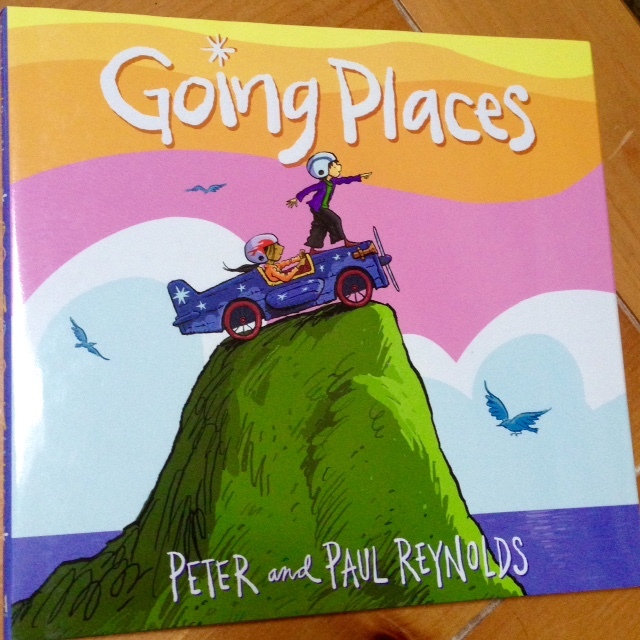 One surprise I didn’t expect was Going Places, by Peter and Paul Reynolds. This was a fabulous find! I cannot believe nobody recommended it to me yet. I’ve loved Peter Reynolds’ ish and The Dot since we discussed them in our Good to Great (#g2great) chats. I read this new title right there at the display, and promptly placed it in my fully stacked arms. Off to the register! What a splendid way to spend your time off–especially with the excuse that it’s so cold outside! Read On! I LOVE, LOVE, LOVE ish and The Dot. I didn’t know he had another book! I need to get that one! 🙂 I laughed at your comment to the store worker that asked if you wanted a bag. hahaha I’ll have to remember that one! Thanks so much for sharing. Love your book stack. I didn’t know about Going Places either. Enjoy your break. Nothing beats taking care of the “to dos” so you have time to read and relax! Enjoy your week. My favourite past time! Great list of books – will add to my ever growing list! Joyful and energetic slice. “Buy as many as you can carry without a bag” seems a good idea. I am afraid that even then I would try to stack many, too many books. You made me curious about In Other Words.